LONGYEARBYEN, Norway, February 25, 2011 (ENS) – The Svalbard Global Seed Vault celebrated its third anniversary today with the arrival of seeds for rare lima beans, blight-resistant cantaloupe, and progenitors of antioxidant-rich red tomatoes from Peru and the Galapagos Islands. The seeds arrived for safekeeping in the depths of an arctic mountain located halfway between the northern tip of Norway and the North Pole; 400 meters below the ground, deep in the permafrost of the island of Svalbard, Spitsbergen. 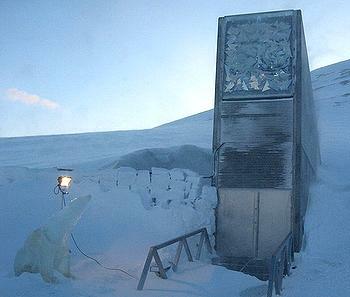 Opened on February 26, 2008, and dubbed the Doomsday Seed Vault, the facility holds 600,000 seed samples at -18 degrees Celsius (zero degrees Fahrenheit) as a backup for crop genetic resources worldwide in the case of regional or global crises. The anniversary seed shipment includes major deposits from genebanks maintained by the Consultative Group on International Agricultural Research, the largest single contributor of seeds to the vault. 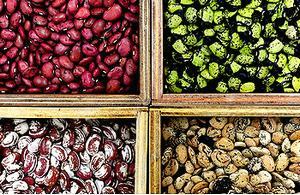 Among the shipments is a Peruvian desert lima bean variety on the verge of extinction that was rescued by the Colombia-based International Center for Tropical Agriculture, as well as other lima beans and relatives that grow in very dry or high-altitude locations. In total, CIAT’s new shipments include 3,600 bean and forage samples collected from 94 countries, including Afghanistan, Nepal, Yemen, Vietnam and Zimbabwe. On the vault’s third anniversary, its managers say the need to secure all the world’s food crop varieties from mounting risks to agriculture – both natural and human – is more critical than ever. “The optimism generated by the arrival of this incredible bumper crop of contributions is tempered by the threats that seem to emerge almost daily to seed collections around the world,” said Cary Fowler, executive director of the Global Crop Diversity Trust, which manages the Svalbard Global Seed Vault in partnership with the Norwegian government and the Nordic Genetic Resources Center in Sweden. “As the threats to agriculture escalate, the importance of crop diversity grows,” said Fowler. Political unrest in Egypt at the end of January led to the looting of the Egyptian Desert Gene Bank in North Sinai, repository for a prized collection of fruit and medicinal plants, said Fowler. Looters stole equipment, destroyed the facility’s cooling system, and ruined data that represented more than a decade worth of research, although the seeds were not destroyed. Meanwhile, the Trust is fighting plans to bulldoze the field collections at Russia’s Pavlovsk Experimental Station, Europe’s most important collection of fruits and berries, to make way for a housing development. Dr. Tony Gregson, an Australian grain grower from Victoria’s Wimmera region, has been alternately baked and flooded over the past few months. He personally accompanied Australia’s first contribution to the seed vault, which traveled farther than any other seeds that have come to Svalbard, arriving on February 16. Gregson sits on the board of the Crawford Fund, which supports international agriculture research. He explains that virtually all Australian food crops come from outside the country. Coupled with the country’s recent bouts of extreme weather, this makes Australia’s farmers particularly sensitive to the importance of global crop diversity. Crop diversity is at risk of being lost due to rapid changes in climate, Fowler said. Earlier this month, the Global Crop Diversity Trust announced a partnership with potato farmers in Peru to duplicate and deposit in the vault seeds from 1,500 varieties of potatoes still found in the Peruvian Andes, where some varieties are threatened by climate change. To keep pace with rapid changes in the global climate, the Global Crop Diversity Trust is moving to collect wild relatives of domesticated crops. With the support of a US$50 million grant from the government of Norway, the Trust is participating in a global search to locate and conserve wild relatives of wheat, rice, bean, potato, barley, lentils, chickpea, and other essential food crops that could contain valuable genetic traits. Click here for a complete overview of the samples stored in the vault.